Spring rolls are a favorite appetizer for many people. This is classic snack. In Thai language it’s called “poh pia tod”, originally its make with spring roll sheet, sprouts, noodles, cabbage and some non veg. I eat vegetarian version in many Thai Restaurant. Fresh colorful vegetable inside and thin crispy wrapper outside makes these rolls fun to eat. From 13th April songkran, traditional Thai New Year is started so I post this my second Thai songkran recipe. · Mix corn flour with 1/2 cup water and keep aside. · Thawed spring roll wrappers and kept under a kitchen towel. · Soaked glass noodles 15 minutes or until pliable and cut into 5 – 6 inch pieces. · Put 2 tablespoon oil in large pan. · Add carrot, beans, soy sauce and oyster sauce mix well. · Add cabbage, chili, salt and pepper, stir fry until the bean sprouts start to soften up. · Add the noodles and stir just mix very well. 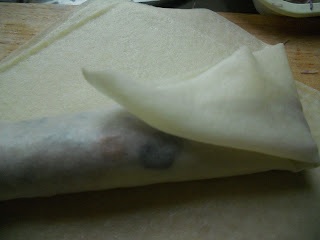 Off the heat and allow the filling to cool completely. 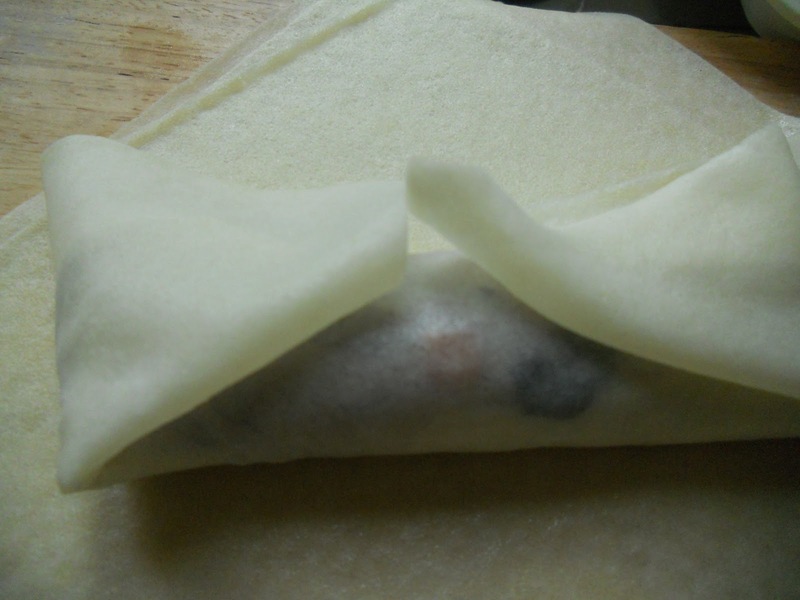 · Fill each roll wrappers with 2 tablespoon of filling. 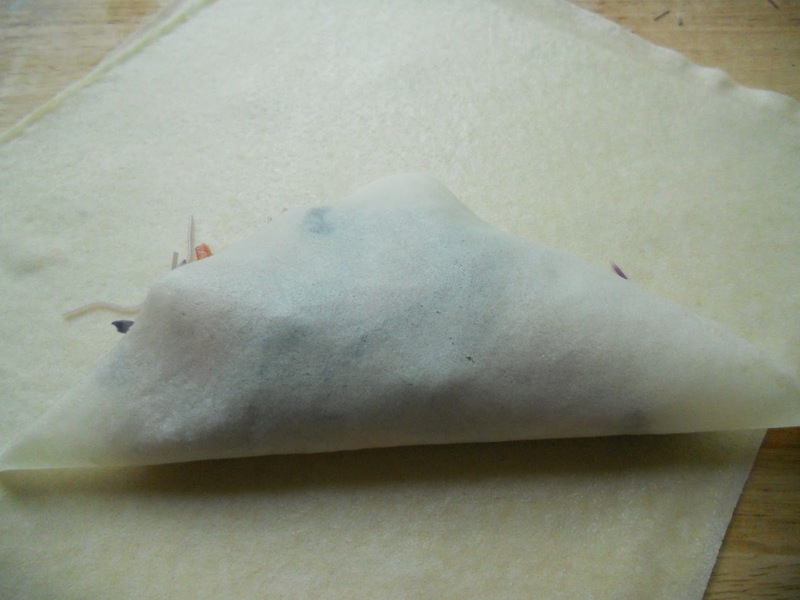 · Then fold the wrapper over the filling. Be sure to wrap up in the corner securely under the filling. 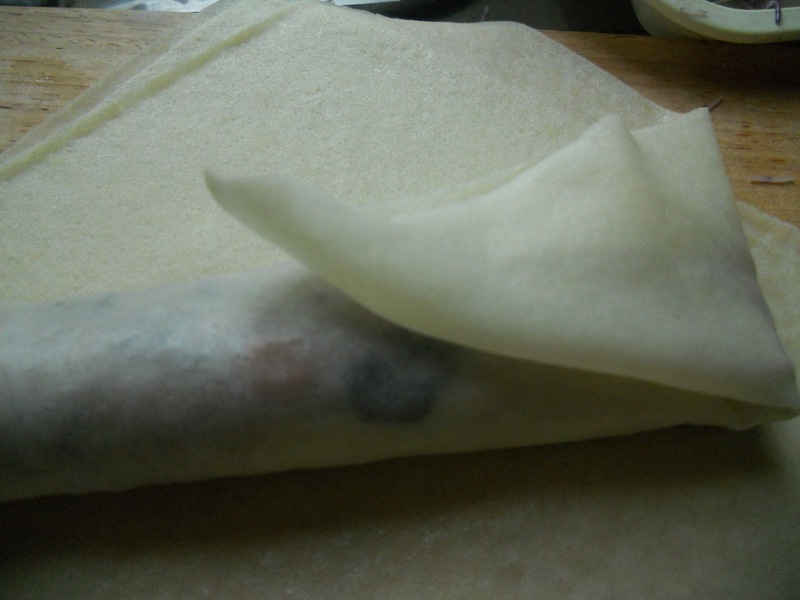 · Roll tightly, brush the edge of wrapper with little corn flour mixture and sealed the roll (See Photograph). 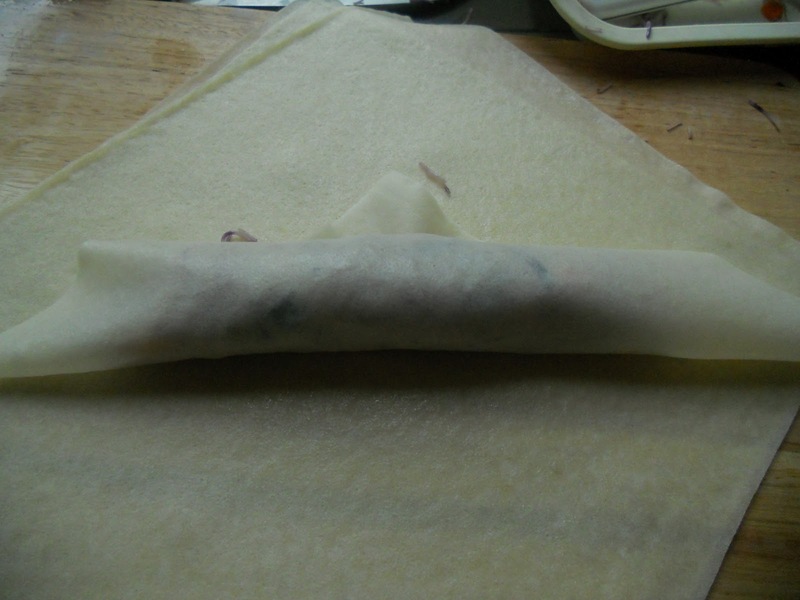 · Place each spring roll seam side down; press it lightly to secure the end tip. · Arrange them large baking sheet in single layer, make sure they don’t touch each other. · Than cover with kitchen towel. 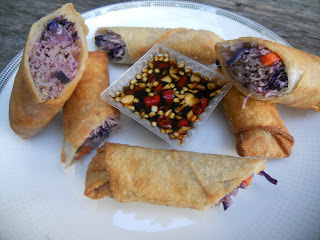 · Heat the oil and fry spring rolls until crispy and golden brown. 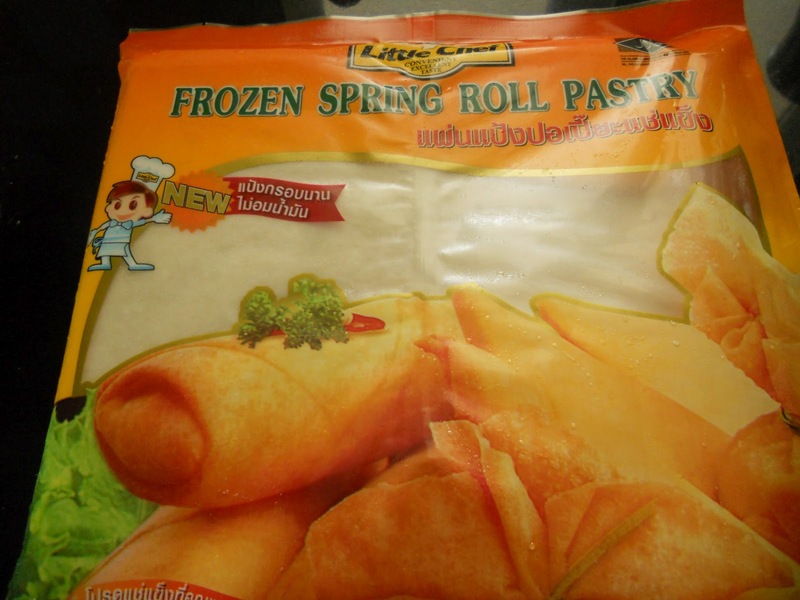 · Cut and serve with Thai table sauce or chili sauce. 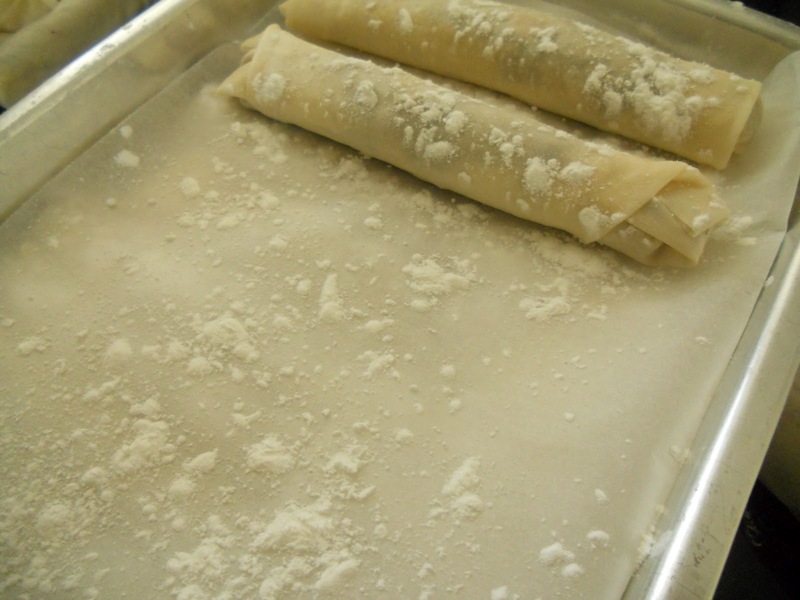 To avoid deep-frying, arrange the spring rolls on a baking sheet and brush the outsides thoroughly with oil. Bake them in a 190°c oven until crispy. 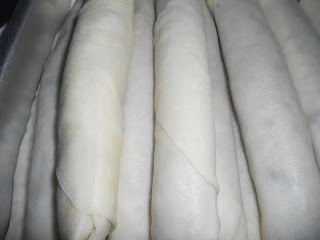 Baked spring rolls will not be golden brown like fried spring rolls and they lose their crispiness sooner than their fried counterparts. But when fresh out of the oven, they're crispy and delicious. 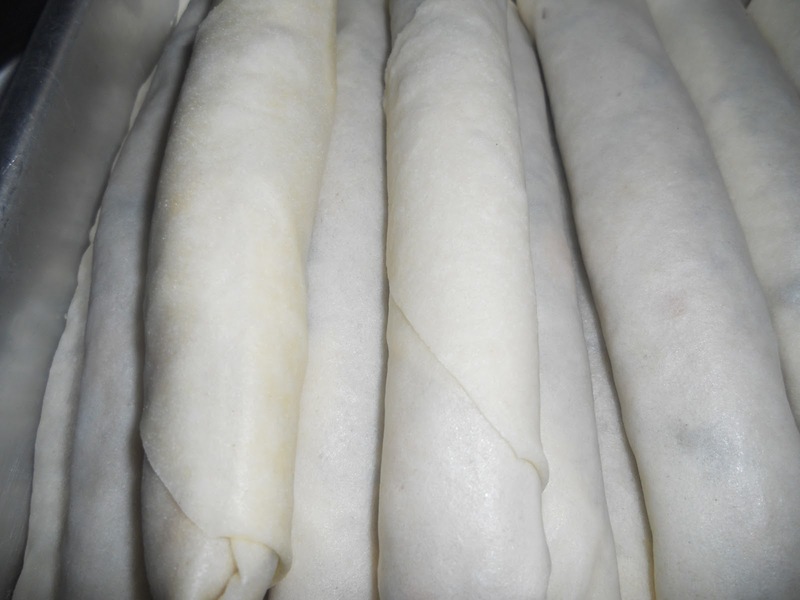 For Store spring roll: Take a freezer container and sprinkle the corn starch in bottom, arrange the spring rolls single layer than cover with baking paper and repeat until all the spring rolls are in the container. Store in freezer.